When R.M.S. TITANIC finished her sea trials and was steaming from Belfast to Southampton, her first known radio contact was made with the Tenerife Coast Station on April 3rd, 1912 in the afternoon. The station was located in the capital city of Santa Cruz. Tenerife is part of the Canary Islands which are situated just off the northwest coast of Africa. This station consisted of four towers each being 75 meters in height. These were initially erected in 1909 and the following year, the radio transmitters and receivers were installed. The station started operating on June 2, 1911. Several years after the Titanic tradegy, the station was relocated to Geneto and remained there until it was closed down in the 1950's. The famous four towers of the Marconi Telegraph Co. 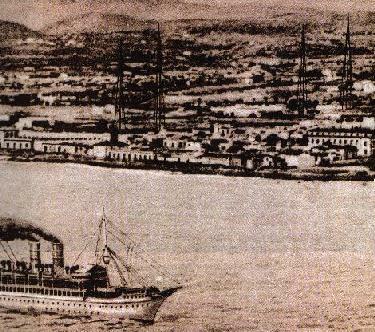 This photo came from a 1909 edition of the local newspaper in Santa Cruz, Tenerife.